Finally after being away from making movies and adding them to my web site, I am able to do it again. So please watch the following You Tube video after viewing this knife. This is a straight forward Fighter in the best of the Andersen Forge tradition. The take-down assembly is assisted with stainless stell fittings and a fabulous piece of African Blackwood - the good stuff. It has been a long time since I've had a knife for sale. I finally got one worked up, here. 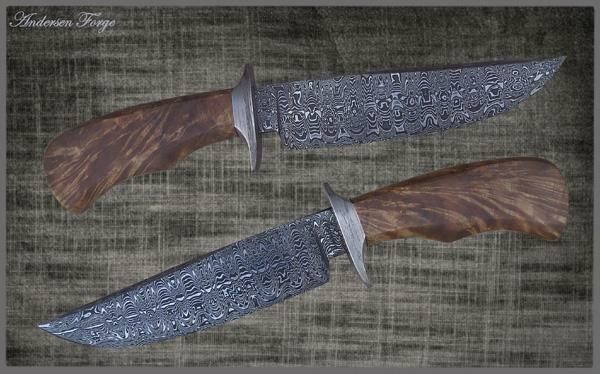 This is an entirely new Damascus manipulated pattern for me, and I can not ever recall seeing another maker doing one. I'm not saying they haven't - I just don't know about it. First I must say this - I just lost a computer to a storm power surge. It fried the power supply. Luckily, I was able to recover most of my Documents, but the photo editing program that I have used for over a decade is not compatible with Windows 7, and there are no newer versions available. Until I get a new program installed and my self educated on it, I only have simple photography to display my knives. The up-coming knives will just have to speak for themselves. This new pattern for me is a not-uncommon Damascus platform of 'Crushed Ws', but I recently acquired a new set of what is called "West Texas Wind" dies for my hydraulic press. These were pressed into the Crushed Ws. I truly and really love this pattern. (I will be doing this next in a Bowie). 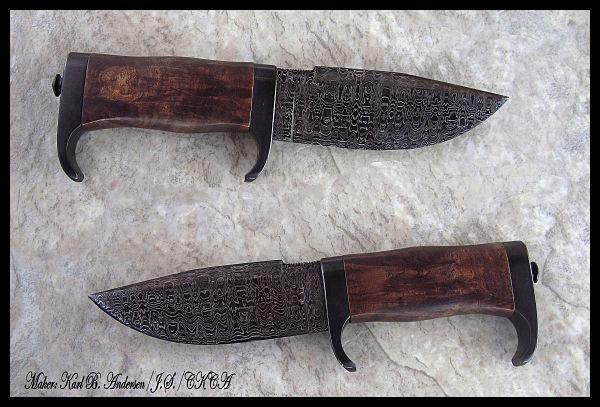 This method of creating the Damascus is a little time consuming and then the final blade is bot-blued, as well. The blade is just a hair over 6 inches, and I promise that once you have it in your hand, you won't be able to set it down. This is the first knife I have completed following my recent shop relocation. 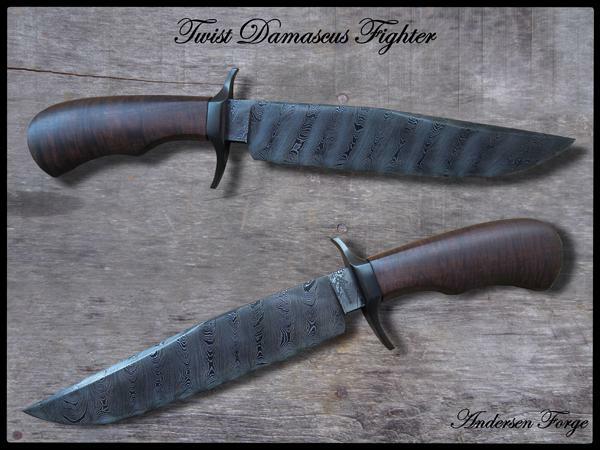 This Damascus Fighter features a full Take-Down construction. The blade was forged from a billet I made of 1095 and 15N20 and increased up to 324 layers before twisting. 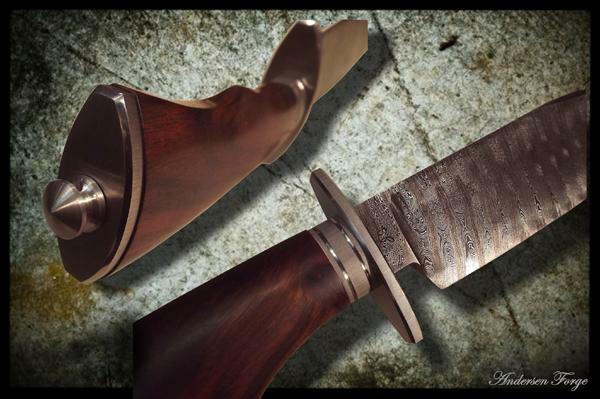 The final blade was then hot-blued along with the mild steel "Lazy S" guard. 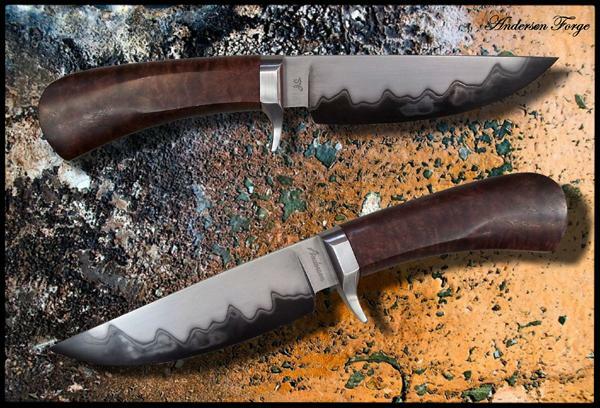 The handle is an extraordinary piece of Australian Ringed Gidgee. The take-down finial in the rear is covered with a decorative piece of Mammoth Ivory. Here is one of which I am particularly proud. 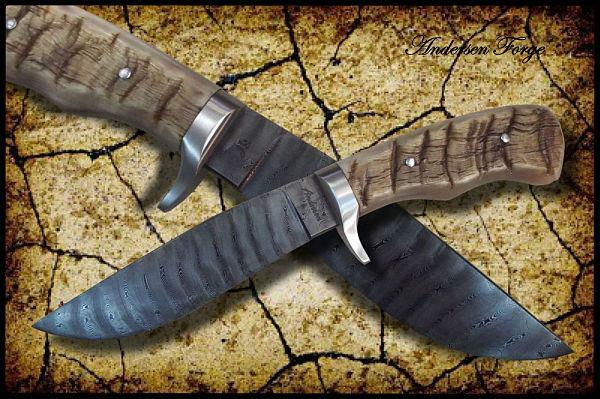 She has a ligh layer count single twist Damascus blade of 1095 and 15N20, which has been hot-blued. The stainless steel fittings have been faceted and selectively polished to reflect the facets in the handle. The Desert Ironwood I used for the handle suits the remainderof the knife quite well. All built in a take-down fashion for full disassembly by the new owner in Arkansaw. 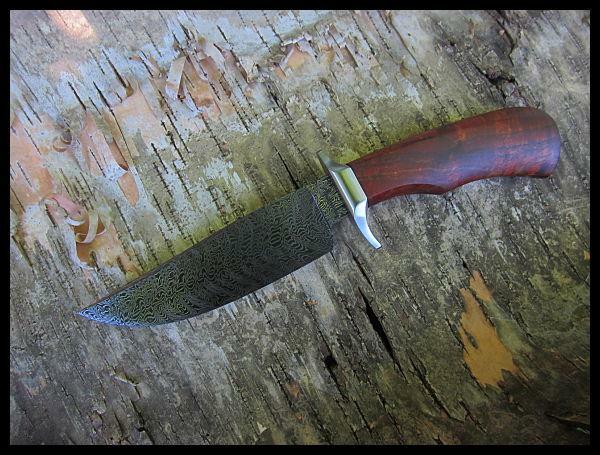 It was recently brought to my attention by the customer who commissioned this knife that I had not put it on my web site. 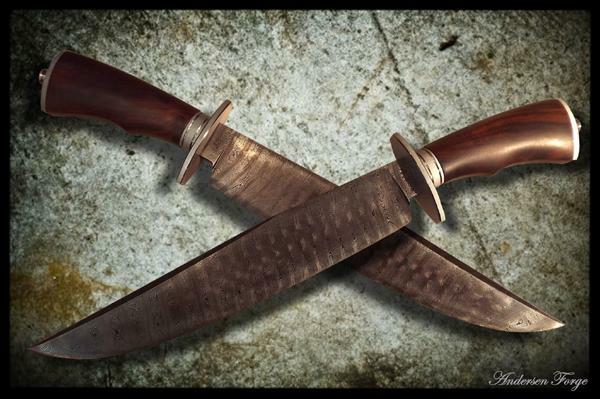 This is my rendition of the iconic Elmer Keith knife as produced by Gil Hibben. 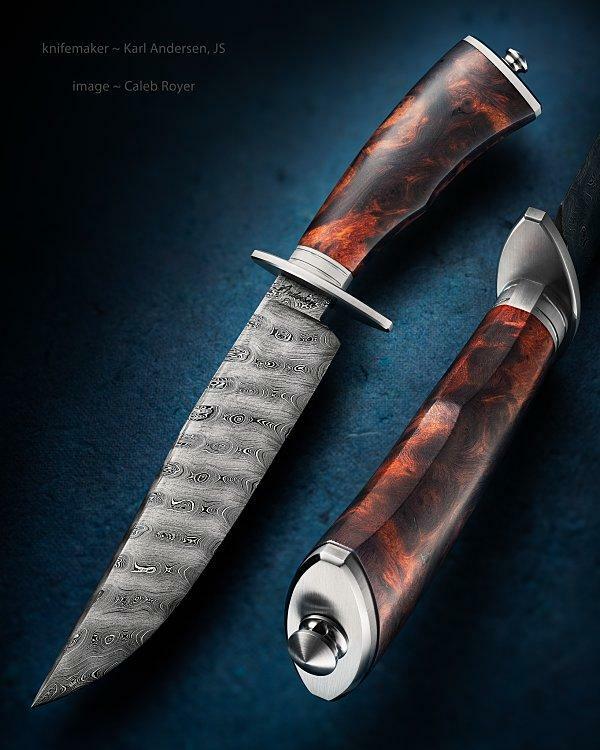 If you are not aware of the amazing story behind this knife, a simple Google search will yield many hours of enjoyable reading. My version, here, showcases Ladder Pattern, hot-blued Damascus, hot-blued take-down fittings and some fantastic stabilized Franquette Walnut. 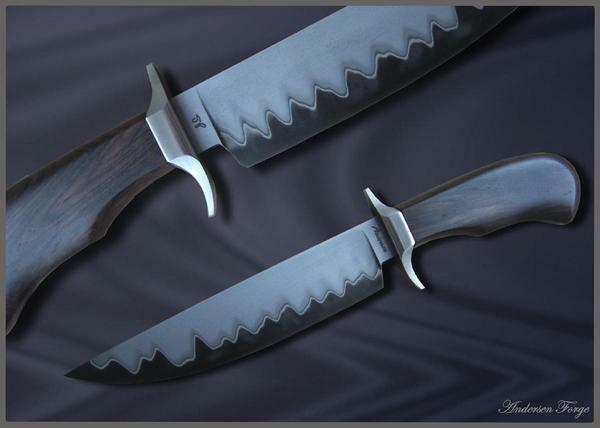 In fact, I was able to show this knife to Gil Hibben in person. His exact words were, "Elmer would really have liked this knife". This is a fantastic hunter ready to be put on a belt. I forged the blade from a 1095 and 410 Stainless Steel billet of San Mai. 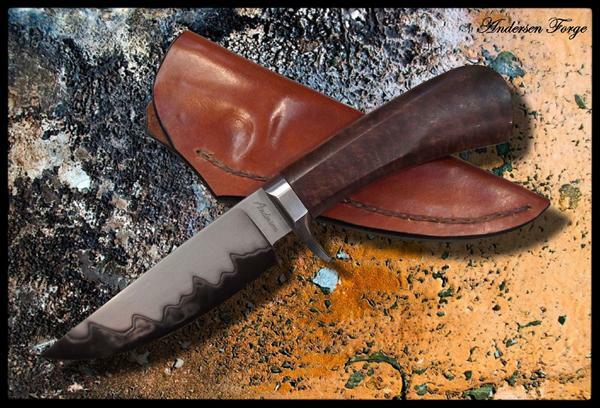 This is a take-down hunter with a 416 stainless steel guard and a magnificent chunk of stabilized walnut burl was used for the handle. I'm not sure how you could do better for a hunting knife. 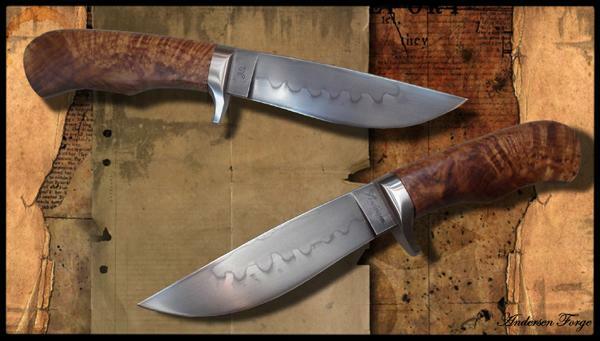 Here is a rather spectacular version of the popular Cowboy Bowie. This is a high layer count (324) Damascus that was given quite a tight twist. I have had numerous folks understandably confuse it with ladder! Seriously - this Damascus is better appreciated under magnification!! The handle is a simple, straight grained piece of Desert Ironwood. I figured I would use what an actual "cowboy" might have on his favorite saddle knife. The take-down fittings are faceted 416. This package includes a sheath, zippered pouch, Certificate of Authenticity and free shipping. Another example of one of my favorite knife styles. The first time I saw this blade profile was at an antique firearms show in Michigan. I t has stuck with me ever since. 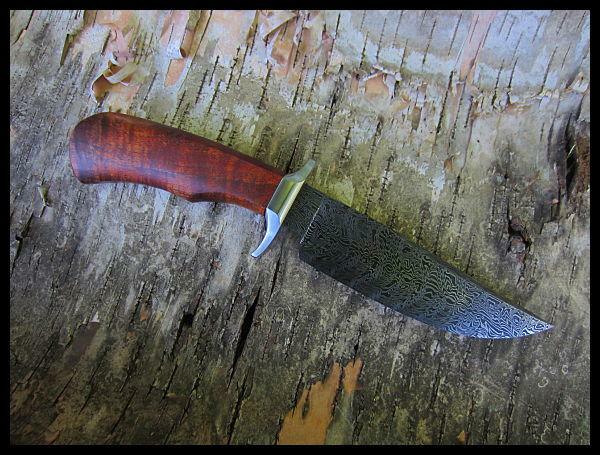 The blade is clay processed W1 tool steel that I forged down from a large round bar. The customer was very patient - a good two year wait. The handle material - Maple Burl - was a gift from a neighbor who had acquired it on his property up here in Northern Minnesota. Since the customer was also from Minnesota, he wanted something from his home state. I also had this material stabilized by Knife and Gun Finishing Supplies. Should be a great belt knife. So, what we have here is a Sheep Horn belt knife. The blade is hot-blued and tightly twisted 324 layer 1095 Damascus. This is not a small knife - it's a handful with a 5 1/2" blade. A 416 stainless guard and wet-molded sheath top off the package. There is just a whole lot going on in this knife. The blade was forged from a billet of 1095 and 15N20, which was "crushed" after the laery count was built up. Then the blade was laddered to reveal one of the most extreme patterns in Damascus - if you ask me. The guard is made from 1903 wrought iron that I personally dug up out of the Iroquois River in central Illinois. The flame Walnut has been stabilized. The take-down assembly finial has been covered by a cute li'l button of mammoth ivory. 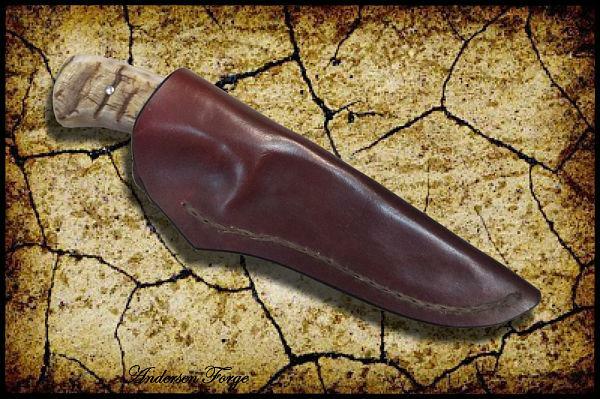 Fitted leather sheath and Certificate of Authenticity included.